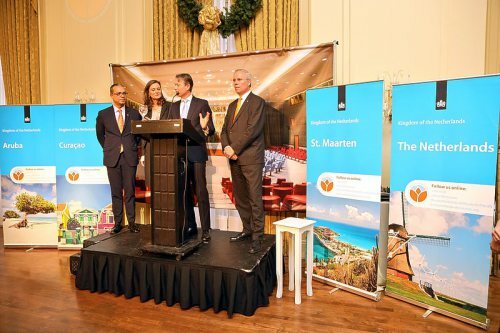 NEW YORK - The Kingdom of the Netherlands, including Aruba, Curaçao and St Maarten, took up its seat on the United Nations (UN) Security Council for a one-year tenure as of January 1. The Kingdom will chair the Security Council during the month March. It has been present as an observer at the Council’s meetings from October 2017. Karel van Oosterom, the Kingdom’s Permanent Representative to the UN, tweeted Monday: “Mille grazie to our Italian colleagues … for a great first year of the Italian-Dutch #SplitTerm in the UN Security Council.” During the Security Council elections in 2016, the Kingdom made agreements with Italy on dividing the 2017-2018 term, so that each state would occupy the seat for one year. Photo: Van Oosterom with other colleagues at the changeover at UN with backdrops featuring St. Maarten and other countries in the kingdom.